← Why Did Trump Really Go Ballistic And Commit A War Crime In Syria? White House Senior Adviser Jared Kushner is leading an unprecedented effort to meddle in the White House’s National Security Council, causing mayhem for senior staff who say the president’s son-in-law is interfering in key foreign policy debates, according to Trump administration officials who spoke to the Washington Free Beacon. Kushner has taken aggressive action to micro-manage the NSC, overshadowing even recently installed National Security Adviser H.R. McMaster, according to sources both inside and outside the White House who described Kushner’s behavior as highly unusual and damaging to the country’s national security infrastructure. Never before has a White House permitted such a figure to intervene in the NSC, which is traditionally given leeway to investigate foreign policy matters and bring advice to the president. 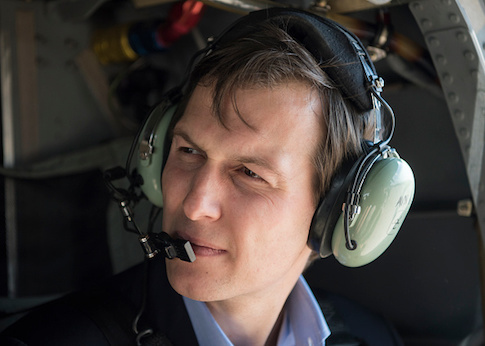 Sources who spoke to the Free Beacon described wide-ranging frustration at the NSC over Kushner’s influence over some of the most important foreign policy portfolios, such as Iraq, Israel, Mexico, Saudi Arabia, and China, among others. Senior NSC staff are finding their hands tied when it comes to performing even perfunctory duties, such as talking points and statements on high profile issues that must go through Kushner for approval. Sources who spoke to the Free Beacon described this level of involvement as kneecapping the NSC and contributing to its difficulties formulating policy. The installation of Dina Powell, a confidant of Kushner’s wife Ivanka, to the NSC is said to have been orchestrated by Kushner in order to solidify his power over the foreign policy organization, sources said. This helps Kushner keep tabs on the NSC’s day-to-day operations, another move that is said to be causing conflict between the NSC and the West Wing. Kushner, in many ways, has even overshadowed McMaster, who sources described as seeking to avoid infighting in the White House. This has only minimized his power on the NSC, officials said. On the other hand, Bannon’s team is said to be more respectful and willing to defer to the organization as West Wing staffers have traditionally done under past administrations. The situation has weakened the NSC and caused internal confusion as to what exactly the administration’s policy is when it comes to a range of key issues. The Free Beacon highlighted this issue in a report earlier this year about the Trump administration’s inability to provide direction over key aspects of the Iran nuclear deal, specifically the U.S. sale of airplanes to Tehran. Update 4:01 p.m.: Following publication of this article, a White House spokesperson told the Free Beacon the NSC was running smoothly.